Outsourcing is a proven, strategic way to reduce and control operating costs, improve Company focus and gain access to world-class processes. Due to the complexity of modern remuneration structures, there is a need for expert guidance and implementation making Payroll Oursourcing significant and effective. Management of the entire take-on process and a tax compliance review of payroll. 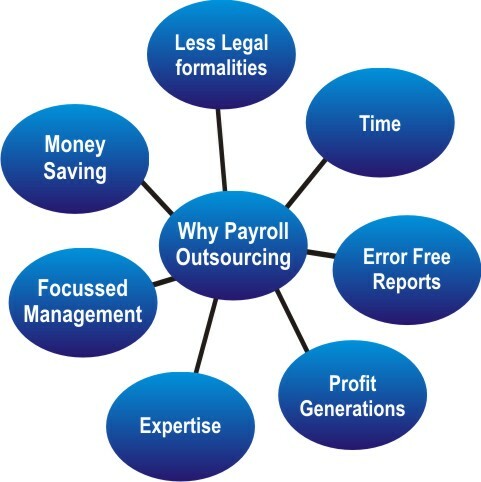 Payroll services for different pay-cycles. In depth review of all variances between current and previous periods payroll data. Comprehensive leave administration as well as accurate monthly calculation of leave liability. Consolidation of reports across multiple companies. Customized reports in electronic format including reports for statutory payments and compliance. Statutory Compliance - EPF / ESI / Professional Tax / TDS / Labour Welfare fund etc. "Hire to Retire" Payroll Services. Local and Centralized expertise readily available to you. Scaleable services inline with your business growth.